Hello and welcome back to the blog! Over the past several weeks, we've been talking about implementing a W.I.N. (What I Need) block during math instruction. If you are new to my blog and you've missed my previous four posts, please take a look at the list and links below. There are a lot of moving parts to a successful W.I.N. block. We've talked about organizing groups, managing materials, and planning stations, but another big part of a successful W.I.N. block is figuring out how to make sure your students are doing and learning what you spent all that time planning. Today I will be sharing with you what I do with in my 5th grade math class. During our 30 minute W.I.N. block, I'm involved in the "Teacher Time" station. This means that most of my students are expected to work independently on a variety of tasks throughout the room while I am primarily focused on my small group. The first step to helping your student stay on task is to make sure that your instructions for each station are very clear. When I first start a new round of rotations, which I did on Monday, I take a moment before W.I.N. block begins and do a quick introduction to each station that is new to students. Try not to have more than one or two stations that need an introduction because you don't want to use too much of your W.I.N. block talking to the class as a whole. During work time, I give myself opportunities for quick walk-arounds. In order to do this, I give my "Teacher Time" group a problem to work on and, while they work on it, I quickly check in on groups. I do this at least two times to make sure that I get a chance to answer questions and monitor any off-task behavior. Another trick to check on on student work, depending on the station, is to have students take a picture of their finished work on a class iPad or other device. I use this when students are working on a task that is not going to be turned in. Recently, my students were working on a coordinate graph sheet. To save copies, I made a few and put in page protectors. Students worked with their partner to complete the task and then took a picture of it to prove they finished their work. At the end of W.I.N. 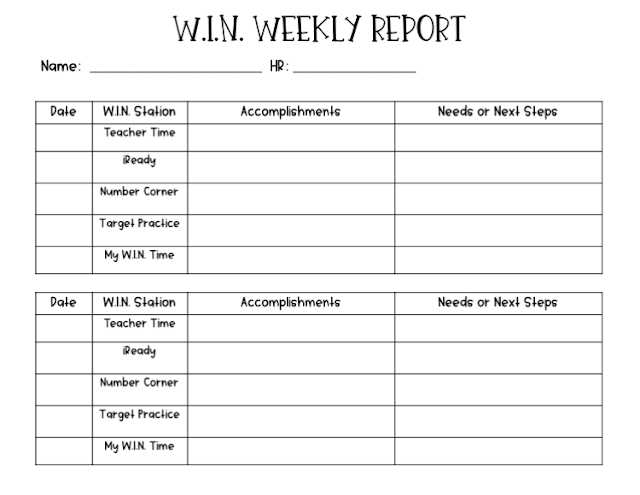 time, I ask each student to complete a W.I.N. Weekly Report. The first version I came up with (see below) worked, but students tended to either write the same thing everyday or to leave it blank because they didn't know what to say. Recently, I made a valuable change the Weekly Report. Click on image to download your own copy. This new tracker has been a game changer for accountability. 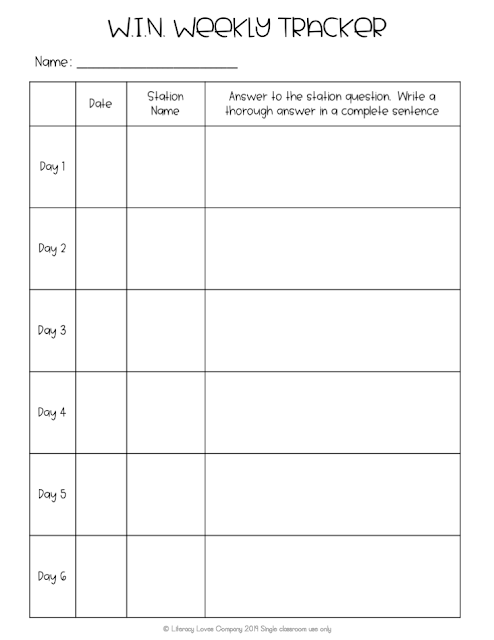 At each station, I create a question that students answer based on what they learned or worked on that day. At the end of W.I.N. time, I collect the forms and quickly read responses. In the margin, I put a star or a check. This is based on the student's response. Stars for complete sentences and thoughtful answers. Check for answers that were vague or not written in complete sentence form. The goal is for students to get 4 or more stars for each round of stations. 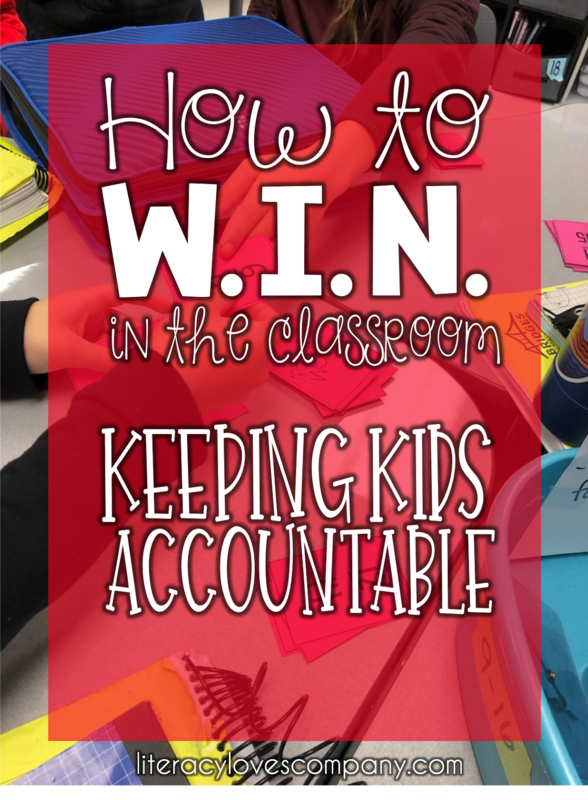 Asking these questions has made a big difference in the quality of responses and my ability to get a better understanding of how students are doing in their stations during their W.I.N. time. The questions don't have to be elaborate, they just need to guide your students into telling you what they worked on that day. For example, my student work on the computer on a program called iReady. The question I had for them last week was, "What was one question/problem challenged you or made you really think today?" Students know the question ahead of time, so they are on the lookout during their work time. 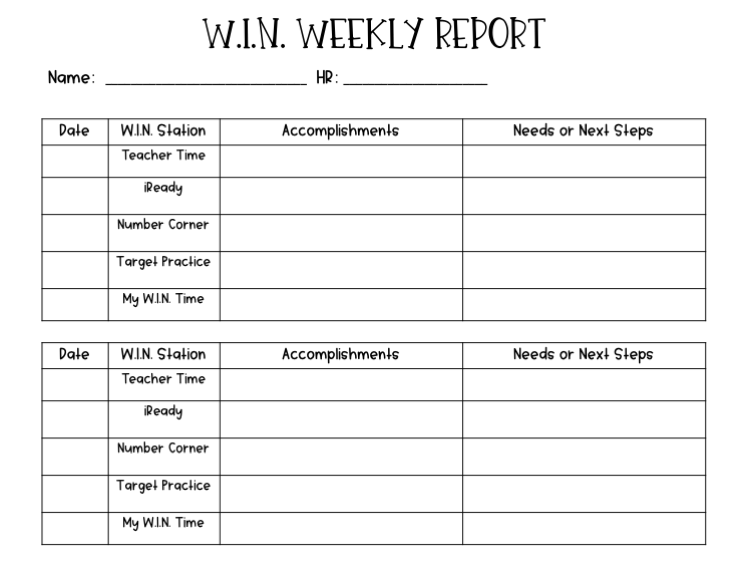 It doesn't take a lot to keep track of student progress and participation during W.I.N. time. Making sure students know what is expected of them before they begin, a plan for checking in with them during their station time, and a quick check in routine after their work is done is enough. As students get into the routine and understand that there are expectations for their production of work and participation, they will be more likely to be focused and on task during this valuable time of the day. I hope that this post has given you some practical ideas for your own classroom. The final post in this series will be out soon with tips and suggestions on how to bring all of the ideas and planning together as you launch your own W.I.N. time! • What is W.I.N.? - free download of "What is W.I.N. Time?" and "Expectations" posters. • Launching a W.I.N. Block - Mystery download! Labels: classroom management, math, math workshop, W.I.N.